I’m looking out over my steering wheel. From the railing ahead, a small, round bodied blackbird stares at me with her yellow eyes. A grouse-like bird alights on the fence post to preen herself. A flock of blackbirds swoops in to perch on the green succulents carpeting the rocky buffer zone between ocean and dry land. Two bully crows roust out all the birds. Moments later, the crows fly off in favor of Japanese tourists posing for photos. Life is sort of a conveyor belt and the view keeps changing. On my way here a red tailed hawk flew beside the passenger window of my car and set himself down on the roadside as I rounded a curve on Bodega Highway. I took him to be a messenger of approval for me to get out of town for awhile. I’m here at the ocean with paper and pen, my timer set for one hour. After that, I’ll head back to town. Tobey, my beloved and very attuned dog, is looking out the window of the backseat, both of us enveloped by the sounds of Bodega Head’s pounding surf and foghorn. I am blissfully unplugged. There is barely any cell phone signal here. My computer and all the internet distractions are on my desk back home. I’m here at the edge of the continent in this liminal place. 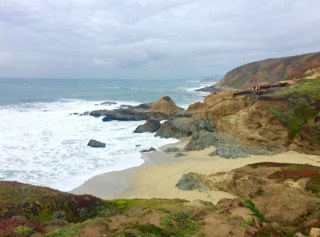 Something about the Pacific coastline has beckoned me for most of my life. Even before I’d ever been to the Northern Pacific, I had a sense that I would end up living here. It’s been quite a journey considering that I began life in landlocked central Kansas. It delights me that in former times the Great Plains were the ocean bed of a great prehistoric sea. By my time the ocean bed had become fertile soil supporting vast expanses of winter wheat and grazing cattle. Perhaps, with different decisions and more courage I could have extricated myself earlier. But what really happened is that it’s taken me a long time to arrive. The first time I left home I moved to the opposite coast. For so many years my innate sense of direction was submerged in outer circumstances. I did a lot of meandering and made many less than fully thought out short-term decisions. Most painful of all were the lost times when I felt stuck in a shadow-land parallel universe, right beside the real life I came here to lead, yet maddeningly compartmentalized and seemingly unreachable. It’s the first week of the new year. Winter rains have been falling all week. The sky is still mostly overcast, but the sun is trying to shine through a thin area of clouds. It’s time to consider what will fill up the calendar this year. Intentions are powerful magnetic attractors. I didn’t journey as far as I have without utilizing the power to focus. The last few years I’ve been pulling together significant elements of my life experience and career into what I call a community ministry. The whole thing hasn’t quite jelled yet, but I know I’m on the right track. At least I’m finally living where I’ve always known I needed to be. There’s an openness here for people like me. And if I’m careful with finances, I have the freedom to live into what is taking form, which is no small blessing. Whoever bestowed the name Pacific upon the ocean before me must have had a sense of humor because this ocean is deadly and violent. At the same time the waves, rocks and sky hold a luminosity that speaks of transcendence over tired, old ways of being. The beauty here acts like a magnet, drawing me to this coastline to envision my own evolving consciousness. Being here, my heart is open to the journey forward as I share my spiritual gifts as a wise woman and an elder. I know a lot about the sweet spots of life and how to steer away from pitfalls. I am evolving ways to bring that wisdom and understanding into shareable forms such as mentoring, writing and music. I have been told that my work catalyzes and supports ongoing awakening and transformative insights for others. I believe that we are all teachers for each other in some way. Living into the fullness of my humanity forms the basis of what I call my ministry. The mission has reached a critical juncture. Like the Pacific, my life encompasses death and treacherous moments. Simultaneously, I live with exquisite times of beauty and inspiration. My hour is up. I’m going to walk to the other side of the parking lot to see if there are any grey whales frolicking about beyond the surf zone as they migrate south for the winter. Clearly there is a lot more going on here for all of us than meets the eye. I know that this year will hold more than I can see from here. What lies ahead is part of an unseen wholeness. Like the whales, I intend to follow my own true nature, the rhythms of life and to frolic about in the waters around me whenever possible.